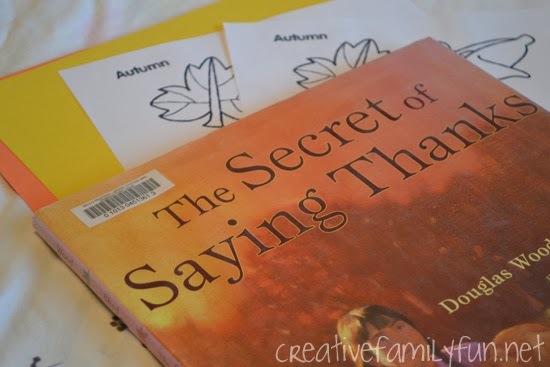 When I stumbled across Secret of Saying Thanks by Douglas Wood at our library, I knew it would be the perfect book choice for talking about gratitude. The words and illustrations beautifully illustrate a secret everyone should know: saying thank you makes you happy. Yes, it’s that simple. It’s a wonderful lesson for children and for adults as well. To extend the message in the book, we wrote a few simple thank you notes. The girl in the book takes the time to thank many things in nature, such as an old tree, rocks, and a bird. I asked the girls to do the same. We were armed with some construction paper and simple coloring sheets I found at Crayola.com. 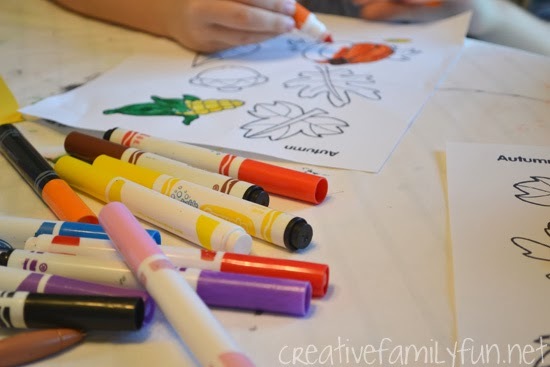 The girls colored in their coloring sheet with markers and cut out each of the images. We used those to decorate our cards. We made the cards simply by cutting a sheet of construction paper in half and then folding each half into a card. The girls glued their cutouts onto the card and then wrote their thank you messages. 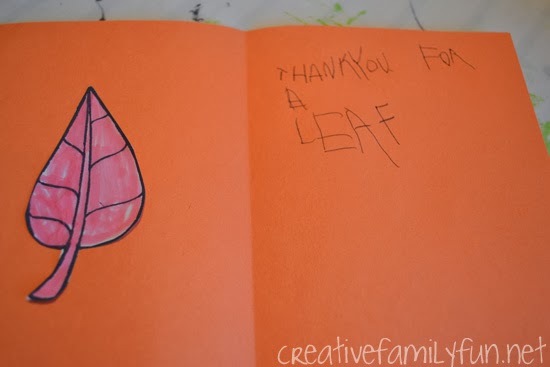 Taking a cue from the pictures, they wrote thank you notes to the leaves. The card above was made by my 4-year-old. She had more to say but was tired of writing! My 1st grader made the card below. “Thanks you for leafs. 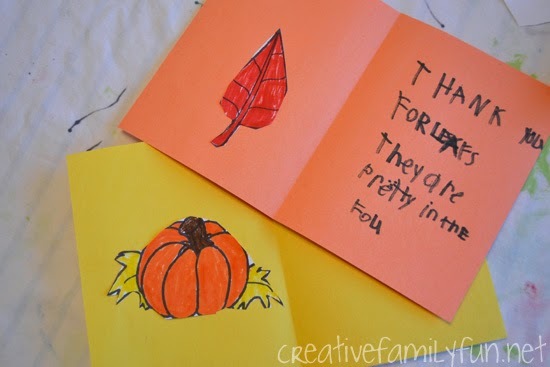 They are pretty in the fall.” I love getting little glimpses into what they are thinking. 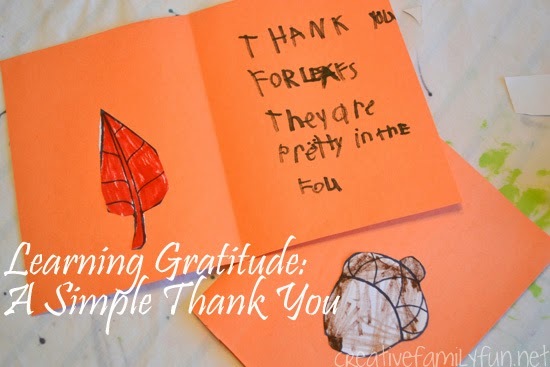 The book and simple craft provided an opening to talk about the things we are grateful for. We spent a pleasant afternoon talking about all the people, animals, and things we would like to thank. While it’s not a Thanksgiving book, Secret of Saying Thanks dives right into the heart of the holiday and is the perfect addition to your reading list. If you could say thank you to anything in nature, what would it be? I’d love to thank all the little birds that visit our feeders on a daily basis. They’re always good for a smile!